The Luna was designed by Boston naval architect John G. Alden Company and built by M.M. Davis and Sons in 1930. 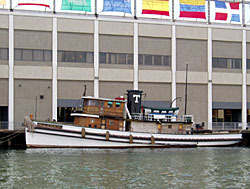 The classic wood tugboat was built for the Boston Tow Boat Company and worked out of Boston Harbor from 1930 to 1971. During World War II, it was requisitioned by the U.S. Navy and participated in the launch of warships, attended ships at the Charlestown Navy Yard, assembled ships into convoys and rescued torpedoed and damaged ships in coastal waters. The full-size (more than 90-foot long) tugboat features a one-level pilothouse, side ladders from the main deck and to the boat deck, and two masts that were typical of Boston Tow Boat tugs. The Luna's design combines a traditional overall appearance with innovations, such as the installation of a diesel-electric mechanical drive system that marked an important transition in tugboat architecture in the second quarter of the 20th century. This type of engine permitted Luna to tow or push barges, freighters and liners, and conduct salvage operations with ease and better maneuverability. The Luna is significant for its enduring and longstanding career in association with the maritime history of Boston Harbor. 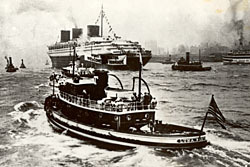 The vessel was the first of its class built for a commercial tugboat company and also one of the last wooden-hulled tugboats constructed. The Luna is the only diesel-electric tugboat still running in the United States and is the last full-sized, wooden-hulled tug in existence on the Gulf and Atlantic coasts. After retiring in 1971, the Luna narrowly escaped disposal and remained on the Boston waterfront as an office and residence. It sank in the Charles River in 1992 and remained there for a year before being raised. The Luna Preservation Society, Inc. took possession of the Luna and began restoration work in March 1995. The Luna (tugboat), a National Historic Landmark, is located at the east side of Commonwealth Pier in South Boston. It is owned and maintained by the Luna Preservation Society, Inc. Tours are available on selected Saturdays. Please call 617-282-1941 or visit the tug's website to obtain the most up-to-date tour information.